After a slow start to the game, with both sides finding it difficult to master a very bobbly pitch on Saturday it took 20 minutes for the first real chance of the game to come. A thunderous free kick by Crossley on 20 minutes was palmed away by MacDonald but just a minute referee Mr. Geldart reduced both sides to ten men, as Garstang’s McGahon and Eagley’s Horam were both given red cards for an apparent altercation off the ball. Another thunderbolt free kick by Crossley was deflected wide as Garstang had become the more likely team to score. That inevitable first goal came in the 36th minute when Roskell’s superb pass split the visitors defence leaving Gierke free to finish in style. Mattichechia spurned a good chance to make it two before the half time break. 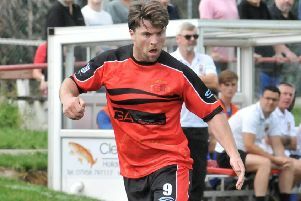 Fawcett was the instigator of Garstang’s second goal in the 53rd minute when he robbed Haynes in midfield, driving forward the Garstang Skipper fed the ball out to Gierke on the right, the experienced striker composed himself before smashing the ball past Macdonald in the Eagley goal to make it 2 – 0. Berry was booked for a foul on Taylor before the visitors pulled a goal back. It looked like Gierke had been brought down in the visitors penalty area but instead Eagley were awarded the free kick. The Garstang defence were caught cold as Vincent applied the finishing touch with 59 minutes on the clock. Garstang re established their two goal advantage after 70 minutes when a magnificent run by Mattichechia just inside the visitors half saw the wide man drive forward before beating MacDonald at his near post. 75 minutes saw the introduction of new signing Lewis for Gierke, the new man should have scored with virtually his first touch but he put his shot wide. The substitute made amends in the 80th minute when his right wing run and pull back for Fawcett saw the midfielder steer the ball past MacDonald to make it 4 – 1. Eagley weren’t for giving in, almost immediately. Bebbington pulled another goal back, 4 – 2. It looked all over when Garstang were awarded a penalty when Lewis’s shot was charged down by hand, but unfortunately for the Riversiders Fawcett’s penalty was well saved with only a minute of stoppage time to play Taylor was adjudged to have handled in the box. Former Preston North Ender and now player manager of Eagley Simon Whalley stepped up to make the final score 4 –3, a welcome three points for Garstang Manager Neil Crossley. The game was sponsored by Foulds Metals Ltd. Fleetwood who chose Gary Fawcett as their Man of the Match. Fixtures: February 21, West Lancs Premier League: Hesketh Bank v Garstang and at the Riverside K.O. 3pm. Garstang Res. v Lostock St Gerards Res.